Living in New York City, I never thought I’d actually be able to have laundry in my apartment. Real estate is scarce and even 500 square feet can feel like a luxury here – much less laundry in the apartment! Luckily, my current apartment allows in apartment washer and dryers so we installed one the second we could. We placed ours in the kitchen, which was the only available space where we could install both a washer and dryer with access to the building water line. If you’re curious about the installation and kitchen design process, read all about it in my post here. Today’s post will focus on our search for a washer dryer combo – namely, a compact 24 inch washer and dryer! About Bosch: Bosch is a German manufacturer and a compact laundry heavyweight in Europe. They have a reputation for making sturdy yet effective machines with solid customer service. For affordability and effectiveness, you can’t beat the Bosch washer and dryer machines, as they’re solidly middle of the pack when it comes to price yet offer extremely fast spin cycles and the smallest washer dryer combo on the market. 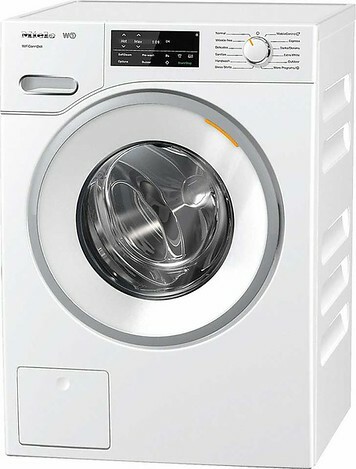 Features: There are 15 cycles for the base Bosch washer, with a quick 30 minute wash and a 60 minute wash for a heavy 8 pound load. The 1,400 rpm spin speed pre-dries your clothes so you can count on a fast air dry or quicker machine dry. Meanwhile, the Bosch vent-less condenser dryer piggybacks off the washer, so you only need one 220 voltage outlet for the pair. Warranty: Bosch covers its laundry products with the industry-standard 1 year parts and labor warranty. As of 2018, Bosch has a couple of compact washers available: the 300 series, 500 series and 800 series. All of them have pretty much the same performance but the more expensive models have extra features that some people might like. 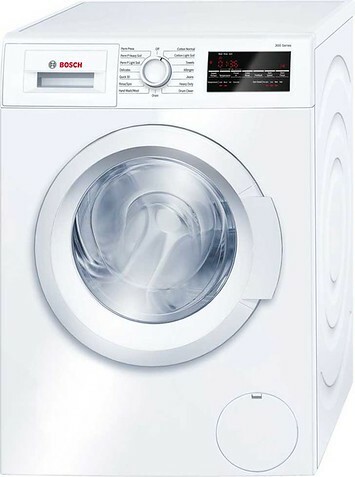 For example, the Bosch 500 series dryer has a stainless steel drum and better efficiency. You can also reverse the dryer door which, in my opinion, is a really nice feature. When I bought my Bosch washer dryer combo, this wasn’t available so my appliance doors open in and knock into each other, instead of opening outward. It also means I have to throw my clothes around the doors in the middle instead of just easily tossing from washer to dryer. 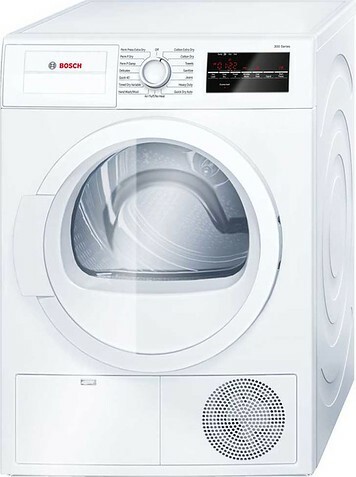 The fanciest models, the Bosch 800 series, have interior lights for both machines and a light load cycle that can wash and dry your clothes in 15 minutes each. 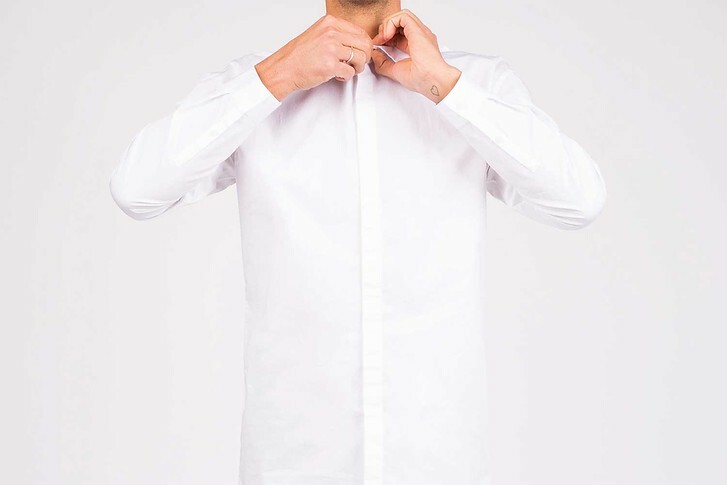 This is perfect if you want to quickly clean a small load, like a week’s worth of men’s dress shirts. If you splurge on the top model, the Bosch 800 with Smart Home, you can use your home Wi-Fi to remotely control your machine and set it to start, say right before your commute home! You can mix and match any of the Bosch models as they’re all compatible with each other. There are slight design differences with the doors, so they might not look like the perfect match but if you panel your appliances like I did then there’s no cvisible difference. I can’t really speak to all the fancy cycle options like permanent press or stain remover, since we use just the 2 cycles. For me, I have a light to medium weekly load of clothes (usually polyester, cotton or silk) and use the 30 minute quick wash with this unscented detergent for sensitive skin. My clothes come out just fine. C sweats a lot and changes his clothes twice a day, plus his clothes tend to be thicker, heavier and larger than mine. He insists on the 60 minute wash and Tide detergent and occasionally complains that his clothes don’t smell squeaky clean. You need to purchase a HE detergent and avoid chlorine bleach, which can damage some of the washer parts. Some people complained about the 220 voltage, but I didn’t see this as an issue. For one, Bosch is a European manufacturer so the voltage reflects its European production. Secondly, most people installing a compact washer are likely doing it in an apartment where you need to hire a contractor for the installation anyway. Contractors can easily install the proper outlet for you. The Bosch washer has a pretty strong vibration during the spin cycle (but is reported to be quieter than all other models). In the beginning, the vibration and noise made me really nervous and I would watch the machine like a hawk. Make sure to remove the transit bolts (we didn’t do this at first and I nearly had a heart attack at what happened) and you can purchase vibration and anti-walk pads to help steady the appliance. I usually set the spin setting to ‘low’ and the heavy vibration only occurs in the last 2 minutes of the 30 minute quick wash, so it’s minimal noise. The Bosch dryer takes forever to dry, as all compact dryers do, because it can’t vent to the exterior. We prefer to air dry our clothes so it’s not a problem for us. Instead, we use the Bosch dryer on select occasions and the key is to let the clothes air out for about 5 minutes. Compact dryers use steam to dry so the clothes always feel damp when you spot check. Just let them sit outside the machine for a couple of minutes and dry out and you’ll find the dryer does a pretty good job! Make sure to remove any change, hair or debris from your clothes before you wash them. A common error is the E18 error code which means the draining timed out usually because something is stuck in the Bosch machine filter. While I don’t sweat very much, I have long hair that sheds like crazy – over the floor, the bathtub and my clothes – so it really clogged up the Bosch washing machine. About a year and half in, the washer was giving me E18 errors with every single cycle and was the biggest pain to fix. If you have the same error, you can watch this helpful YouTube video which will walk you through the process. Essentially, you need to clean out the filter but because the machine couldn’t drain on its own, you have to manually drain the laundry of all its water. It’s time-consuming and annoying, because Bosch places the drain on the very bottom of the machine, so it’s guaranteed that at least some water will flood out and destroy either your cabinets or your floors. I called Bosch’s customer service and they came to fix it. Naturally, the warranty had already expired so I paid out-of-pocket. The expense is very pricey (could be just that I live in New York City but I think in general it’s expensive) as they charge a fee just to show up plus an hourly rate, billed in 15 minute increments. It cost about $200 for me to fix but took the customer service rep only about 10 minutes. Would We Repurchase the Bosch washer dryer set? Ultimately, we’re pretty satisfied with the Bosch washer and dryer and would recommend purchasing. Below, I share more about good things to look for when selecting a small washer dryer for your apartment, the best brands that specialize in making compact washers and dryers and finally, aggregated reviews for each washer/dryer combo. We looked for a compact washer dryer combo since we couldn’t fit a full size laundry set in our tiny New York City apartment. The smallest washing machine and dryer available on the market is 24 inches wide, with a load capacity of 2.2 cubic feet. In comparison, a full size washer (by American and Canadian standards) is 27 inches wide. It doesn’t seems like sacrificing 3 inches is a big deal. But, full size washing machines have a capacity of anywhere from 4.0 cubic feet to 5.3 cubic feet because they’re also deeper and taller – typically 30 inches deep and 36 inches tall. So if you choose a small washer and dryer, expect to wash smaller loads more frequently! Because our washer / dryer had to go in our apartment kitchen and space was a premium, we could only use a 24″ washer and 24″ dryer and focused our appliance search on these compact, European style machines. You still have the option to either stack them vertically or place them side by side! Front Loader vs Top Loader: Pretty much all compact washers are front loading, meaning the door opens on the side. If you forget to wash a towel or sock and want to add in clothes mid-cycle, you can easily do that with a top washer but you can’t with a front loading washer. The door locks once the cycle starts because otherwise, water would gush out everywhere! Matching Pairs: Because these machines are compact, it’s recommended to buy both machines from the same manufacturer. The available models have slightly different depth and height dimensions across brands and their electrical and water hookup requirements can differ so to save yourself the trouble, buy both from the same brand. The nice thing is retailers sometimes offer a discount when you buy both! Washer spin speed: Machines that have higher spin power can better wring out clothes so that they’re not sopping wet when the wash cycle ends. I definitely wanted my clothes as dry clothes as possible so a washer with a minimum spin speed of 1,200 RPM was recommended. Compact dryers are typically ventless (more on what that means in the next section) and notoriously known for slow dry speeds so if you’re between two washer models, opt for the washer that has higher spin speed. An accelerated wash cycle: If you leave washing your clothes to the last-minute and want to run a normal cleaning cycle in half the time, you’ll want to find a machine that offers accelerated cycles. A standard front loading washing machine will take about 90 minutes, but some brands offer accelerated wash cycles of 30 – 60 minutes. The trade off with time is that your clothes may be treated a little more roughly or the cycle may be less energy-efficient. Capacity: Pretty much every compact washer has a capacity of 2.2 cubic feet but most list their capacity in pounds – anywhere from 15 – 18 pounds of laundry. Noise and Vibration: Since the laundry was going in my kitchen, I was concerned about the noise and vibration. The noise is definitely noticeable and the vibration especially so. I sometimes wonder if my neighbors can hear when I’m doing laundry. You can buy vibration absorption pads to help grip the floor and provide more stability. Most people have a vented dryer, meaning the appliance vents to the outside of the home through a steel duct. On the other hand, compact dryers are ventless, meaning they don’t vent to the outside. This makes sense, because usually it’s apartment or condo dwellers who buy a small dryer and with shared living you don’t have the option to punch a hole to the exterior. A full size vented dryer works like a vacuum. It pulls in air, heats it and tumble dries your clothes. Then, the condensation from your wet clothes is pushed to the air outside through the exhaust. They’re cheaper to buy, can hold more clothes and dry faster than small ventless dryers. A small ventless dryers uses a condenser to heat the air and help evaporate the water. Air can’t be pushed outside so it circles back to the condenser to be cooled down while the water from your clothes leaves via a water pipe (typically shared with your washing machine). Ventless dryers are technically safer, since they can contain a fire while most vented dryers can’t and they’re greener, or better for the environment and the air in your home. They’re also small and compact but the downside is that they’re expensive, work very slowly, and still leave your clothes pretty damp. You should expect double or triple the amount of time a normal vented dryer would take! Water Pump vs Dryer Reservoir: The water from your clothes needs to go somewhere. Some dryers share a water pipe with your washing machine while others can store evaporated water in a reservoir. While the later sounds handy, you still have to empty this pan by hand, so I don’t think the feature is particularly attractive. Lint Filter: You still have to clean your filter for debris and lint. There’s a second filter that you should also clean regularly. A great ventless dryer will store both filters within easy reach. (Some stick them on the bottom or back of the machine which is annoying). Condenser or Heat Pump: A newer type of technology is the heat pump dryer which uses an active heat exchanger filled with refrigerant to remove moisture. Heat pump dryers still take a long time to dry your clothes but they use about half the amount of energy and they’re gentler on your clothes since they can use lower heat temperatures. They’re very efficient and green, since they have almost no effect on climate control. Of course, with all the benefits comes a higher price tag. Heat pump ventless dryers are also pretty hard to find in the US – look for a European manufacturer. If you’re on a budget, I would consider skipping a compact dryer altogether. It’s nice to have a matching set but we personally air dry our clothes on racks. It’s much better for your clothes to air dry and ventless dryers take so long it’s not really worth using them on a weekly basis. We like having ours for emergencies – say you spill something and want to dry it quickly, or you need an emergency pair of fresh undies and socks. If you buy a dryer for your apartment, there are a couple of design considerations like the electrical voltage and appliance placement. I talk in-depth about that in this post where I cover our kitchen design and renovation. For a long time, only European manufacturers made washer and dryers that could fit in a small apartment, since placing laundry in the kitchen is pretty common in Europe. The only 3 brands that had compact washer and dryers when I did my renovation ~3 years ago were Bosch, Asko and Miele. I took a look again and was pleasantly surprised to see that GE and Samsung now make compact washers that can fit in an apartment kitchen or closet. These are cheaper than the European machines but slightly larger in terms of their dimensions. Asko: a Scandinavian appliance brand. I was really interested in their machines since they can be paneled (which creates a cleaner look). Asko washers are really hard to find in the US but you can special order them through AJ Madison. Bosch: ultimately the brand I went with. Decent price point and seemed relatively popular in the US. I’ve seen lots of luxury rental buildings in New York that used the Bosch washer and dryer stacked combo. Miele is a luxury appliance brand that gets rave reviews for the quality of their dishwashers. I couldn’t find more than a couple of reviews about their washing machines but the people who had them gave favorable reviews. Samsung: a Korean brand known for appliances. now makes small washers! GE: an American brand known for appliances. now makes small washers! When I was deciding which to buy, I went first by the measurements because I needed both the washer and dryer to be as small as possible. My entire kitchen is 6 cabinets! 3 on each side, in a galley style layout. There was no extra room for massive appliances. We ended up purchasing the Bosch compact washer and dryer since they seemed to be the most commonly purchased compact washer dryer combo in New York. Bosch also has service reps in the area in case of any issues. The price point for both the 24 inch washer and the 24 inch dryer was well within our renovation budget compared to the other European manufacturers. We ended up purchasing all our appliances through AJ Madison. They’re a huge online appliance store and carry the largest range of American and European brands that we could find. Overall, the website was really easy to navigate, they offer a slight extra discount for purchasing through them and they price match. Everything was delivered well packaged and right to our door, plus we got free shipping. We looked at Best Buy and Sears too but overall their stock of compact washer and dryers was very limited and their prices were higher. About Miele: Miele is a family owned German company known for luxury, well made kitchen appliances. They are well-regarded in Europe for their excellent build quality and make 98% of their product parts in their own factories. Miele has also built a reputation for long-lasting products that don’t often require repair. Features: Miele offers 3 washers and 2 dryers, all of which are Wi-Fi enabled. Miele’s washers offer gentle, quiet cleansing, a strong 1,600 spin speed and relatively quiet vibration noise. 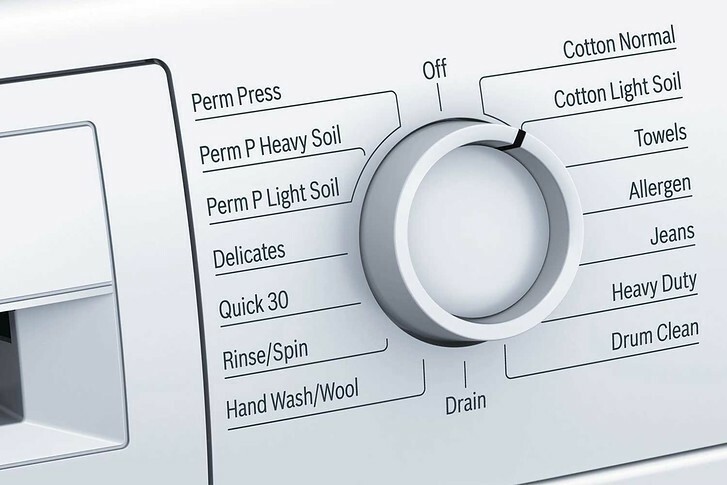 The washing machines have a unique technology called automatic load recognition, where they adjust the amount of water and electricity used according to each individual load, so that your clothes are cleaned and rinsed efficiently. The company also allows detergent to be integrated directly with the machine, so that the appliance can decide the optimum amount of detergent for each load. The two dispensers can use Miele’s own detergent or conventional detergent brands (both liquid and powder). Each washing machine comes with enough Miele cartridges to last for about 6 months. On the dryer front, Miele is the first to offer heat-pump dryers, which set them above the competition. As a bonus, the machine uses a 110 volt so no need to wire a new electrical outlet! 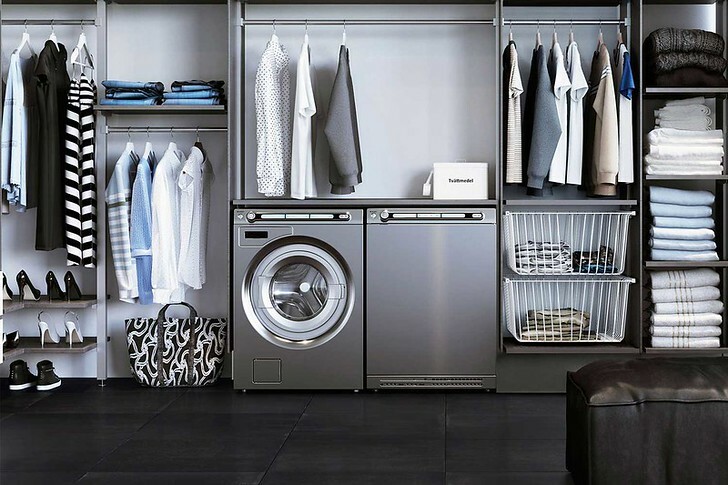 Finally, if you want to customize the look of your laundry, Miele is the best option. Select Miele washer and dryer lids can be replaced with a building under kit to be perfectly built-in under a 32 inch work top or cabinet base. About Asko: If you like minimalist Scandinavian design, you’ll love the sleek, stainless steel finish on the Asko washer dryer set.d All their washers and dryers are ENERGY STAR certified to use about 25% less energy and 45% less water than standard machines. 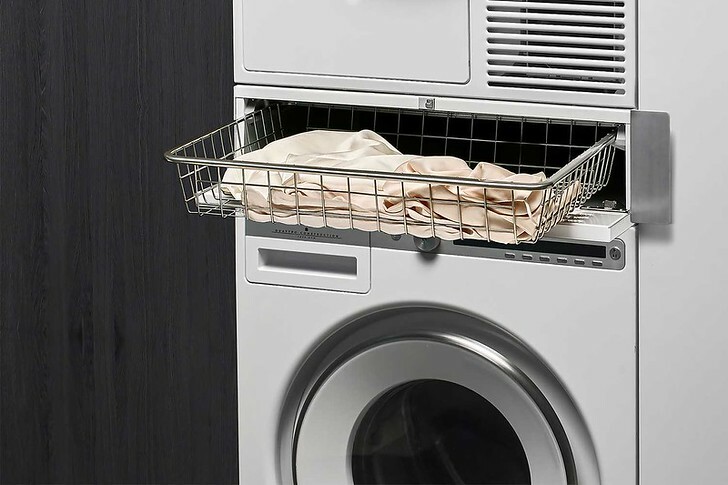 Features: Asko’s washer offers 10 cycles, with a standard wash time of 75 minutes. The hourglass drum is designed to gently clean fabrics while the door doesn’t have any rubber, to minimize odor and mildew buildup. Both the inner and outer drum are made from stainless steel for a strong, quiet wash operation and longer appliance life. 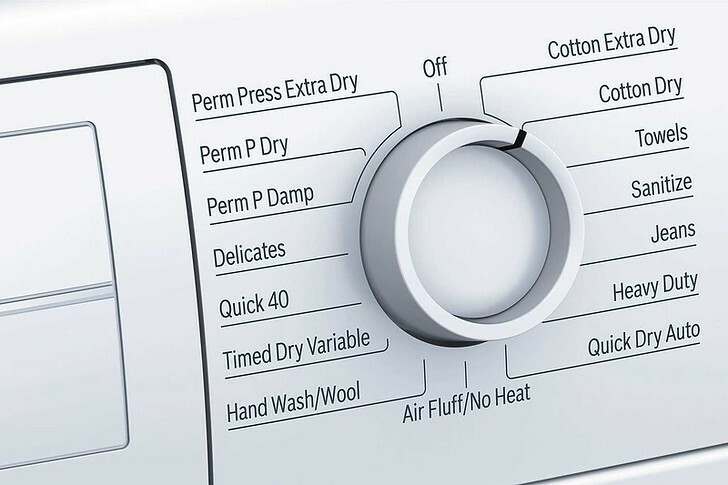 The dryer has an auto system that automatically detects the length of drying time required for each load, stopping on its own once the clothes are dry. It also spins the clothes in a ‘butterfly’ pattern, or a figure 8 configuration to allow air to circulate between the clothes and minimize creasing. Some Asko dryers are the classic vented model while the newest 2018 dryer is a heat pump dryer. Warranty: Asko offers an above average warranty of 2 years. Which compact washer dryer are you deciding between? Once you’ve narrowed down a washer and dryer choice, read about design considerations and installation pitfalls here so that you design your laundry room or in kitchen laundry properly! This is SO helpful! I’ll be getting married soon, and on our income we won’t be able to afford more than a tiny apartment. Knowing which washer and dryer to get is super necessary. Thanks for sharing! No problem! So glad it’s helpful, I couldn’t find anyone’s personal experience when we were installing ours! 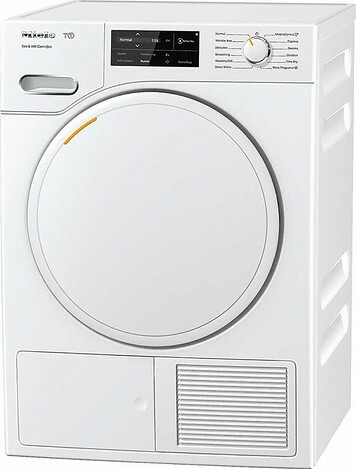 I’m hoping that you can recommend a stackable Washer and Dryer to fit into a Parisian apartment. There is adequate space where they will eventually sit, but to get there, they must pass through two doorways with a maximum width of 22-3/4 inches if I take the doors off their hinges. Any suggestions would be most greatly appreciated. Hi John, Ooh a Paris apartment sounds like a dream. I’m sorry, I don’t know any smaller washer dryers but if you’re in Europe you probably have access to more European brands and small size appliances than we do in the US. You might have to just widen the doorways, and then re-patch (we did this in the kitchen to match a half wall to the counter depth), or perhaps you can air lift the appliance in through the windows? I am looking at the Samsung 24 inch washer/vented dryer. But I could modify my closet to fit a 27 inch LG washer/dryer. It would stick out a couple inches. I am worried about the reliability of the compact units since there are not as many of them sold. I used to have a 3.1 cu ft washer and it worked great. I think the 2.2 cu ft unit may be too small. Any thoughts?